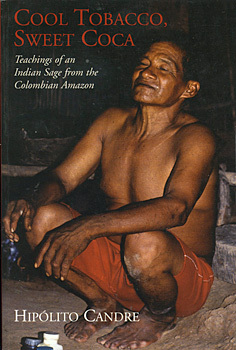 Cool Tobacco, Sweet Coca is a first-hand account by Hipólito Candre ("Kinerai"), an Indeian healer from the Colombian Amazon. Translated from the Uitoto language and commented on by the anthropologist Juan Alvaro Echiverri, it contains a selection of Kinerai's narratives, transcribed from numerous tape-recordings, presented in both Uitoto and English. In order to convey the spirit and power of his words, Kinerai's teachings have been rendered in a highly poetic style. He describes how we were formed by the "Word of tobacco and coca", the Word of life, and talks of the Planter of the True Seed, the Word of strength, the Word on discipline, the Invocation for the pregnant mother, the tasks of the mother and the father, and the care of children. He also relates traditional narratives, including the Dreams of Abundance and the story of the giant armadillo. The Spanish-language edition of this book was awarded the National Prize for Indian Literature in Colombia in 1993. "What comes across so well in this book, perhaps better than in any other, are the crucial moral and ethical dimensions to what to most would seem to be merely ordinary practical activities. Through such "Words of life", a genre found throughout the north-western Amazonia, peoples such as the Uitoto convert the practice of living into a true art of life in which ethics and aesthetics are conjoined... This book steers a fine course between the exotic and the everyday, bringing them together in a powerful synthesis."